Sometimes I go out to eat, take photos to review for the blog, then forget about them. In fact, blogging in general lately has taken a backseat to work, schoolwork, housework... lots of things with WORK in the name! And when I do have spare time, the siren call of the TV gets me every time. Oops. Recently, before she headed out on a long trip, Lindsey and I went to dinner at Mack & Kate's, a place I'd been before with coworkers for lunch and knew was a solidly good local restaurant choice. We needed to break up our routine of Puckett's Boathouse and Mellow Mushroom. This restaurant is set back in a shopping area adjacent to apartments and condos, not on the beaten path for non-locals. 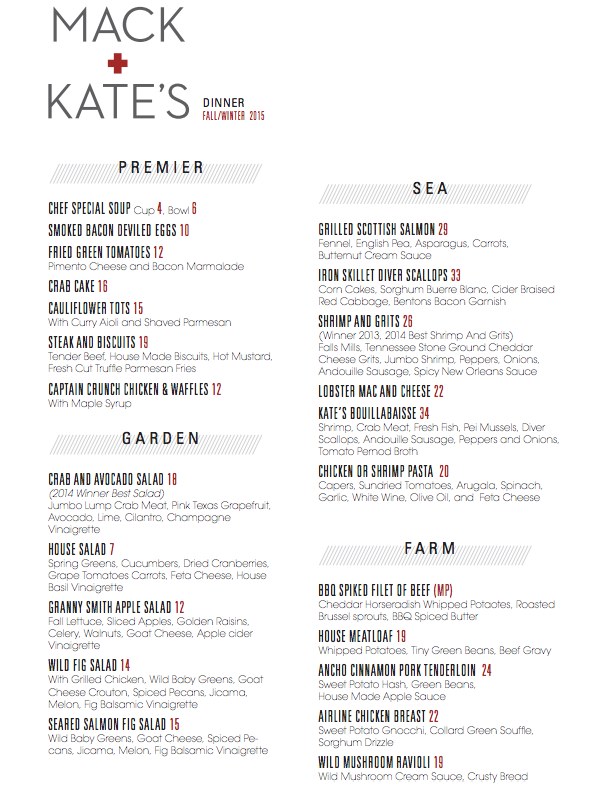 I love that their menu is seasonal and locally sourced, though it seems that's everywhere in Nashville these days. The decor is adorable, kind of like everything was purchased at a Southern Living shabby chic shop. To start, the wine list is good and the server was able to give me solid recommendations. I chose a cabernet to drink, and we munched on the tiny dinner rolls provided. The butter that came with them was so good! 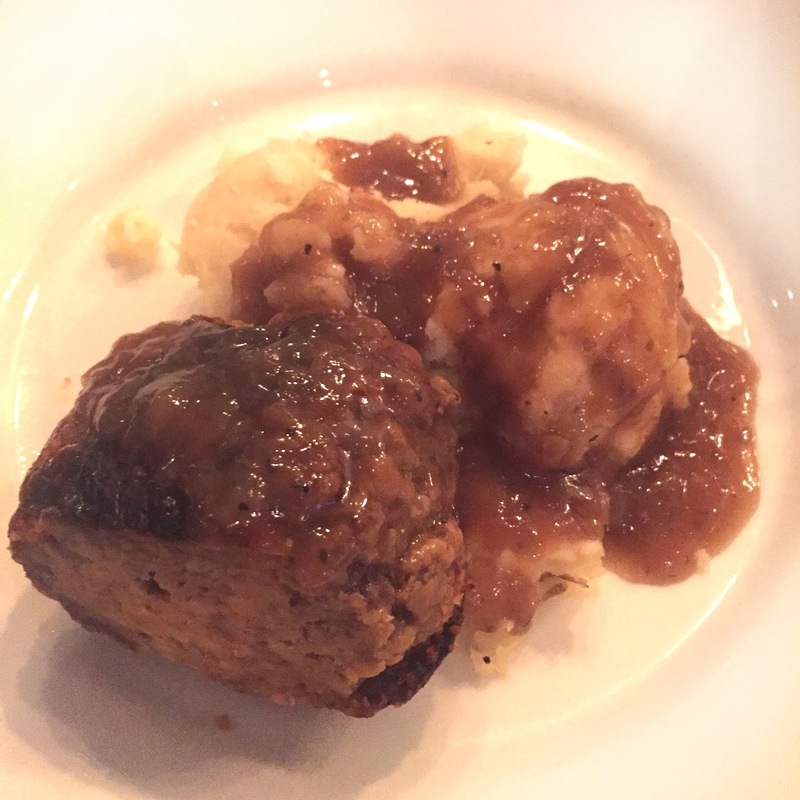 For my main course, given it had been chilly and drizzly, I settled in for the House Meatloaf. I opted out of the green beans, which led to a heftier potatoes portion, which I definitely didn't mind! It was a good meal; not mind-blowing, but hearty and warm on a cool night. I prefer other dishes I have had during their lunches, including their awesome mac and cheese. Lindsey had a meal of BBQ spiked filet of beef, served with gorgeous Brussels sprouts. I couldn't resist sharing a photo. What sold me on my recent dinner was ending with dessert. So many options! We chose a pumpkin pie slice for a chilly fall days and the whipped cream on our pie was sooo good. I'm still thinking about it. Mack & Kate's is always a safe bet for a good lunch or dinner. I definitely recommend that you make a reservation if coming in for dinner, because it does fill up and the pace of service is on the slower side as tables don't turn over in a rushed manner. Not only that, but people like to linger! It's a favorite for locals purely based on location alone.